The Nai Harn Reservations. Call 020 7962 9933. Luxurious Nai Harn overlooks a peaceful and beautiful bay on the paradise island of Phuket in Thailand. Gaze out to the turquoise waters of the Andaman Sea from your private terrace, take an island-hopping cruise, indulge in pampering treatments at the tranquil spa and eat the freshest gourmet dishes in the contemporary restaurant. The spa at Nai Harn is the ultimate chill-out space, with stylish treatment rooms decked out in cool ocean and driftwood tones. Therapies include traditional Thai massage as well as body scrubs and facials. 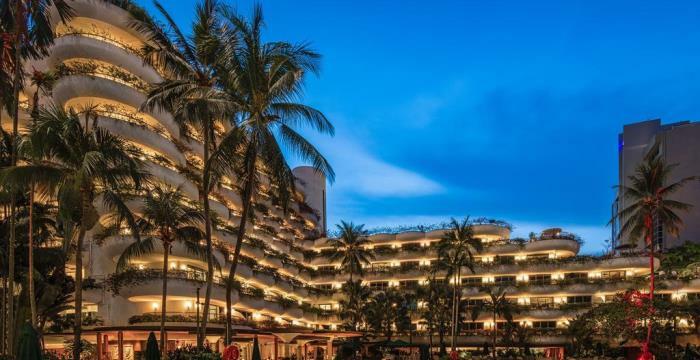 Decorated in cool neutrals with pops of vivid tropical colour, Nai Harn’s 130 rooms all have high-tech TVs, free WiFi access and luxe bathrooms. But the real stars are the private terraces, each looking out over the beach and bay. All the terraces are fully furnished, most with four-poster day beds where you can totally relax while you take in the stunning views. Nai Harn’s gorgeous pool, surrounded by palms and lush, flowering shrubs, is as relaxed as it is stylish, or you can head to the private stretch of beach for your daily dip. There’s also a watersports centre at the hotel, where you can learn to dive or hire snorkels. Rock Salt is a hip beachside restaurant where sea breezes, candlelight and Asia-Pacific cuisine combine to create an unforgettable ambience, while ultra-contemporary Cosmo Bar and restaurant offers cocktails and fresh seafood in a bright, open space.